Tip: An investment is based on incisive, quantitative analysis, while speculation depends on whim and guesswork. Looking at their recent track records doesn’t do much to settle the debate. 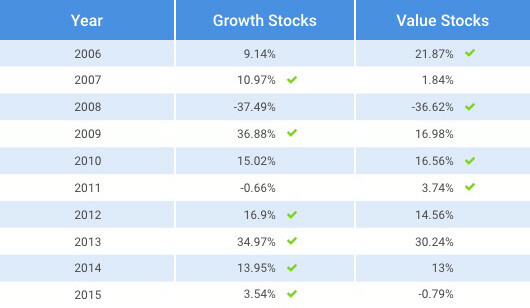 As you can see from the chart below, during the past 10 years, growth stocks came out on top six times and value investing four times. Value investors look for bargains. That is, they attempt to find stocks that are trading below the value of the companies they represent. If they consider a stock to be underpriced, it’s an opportunity to buy; if they consider it overpriced, it’s an opportunity to sell. Once they purchase a stock, value investors seek to ride the price upward as the security returns to its “fair market” price—selling it when this price objective is reached. Most value investors use detailed analysis to identify stocks that may be undervalued. They’ll examine the company’s balance sheet, financial statements, and cash flow statements to get a clear picture of its assets, liabilities, revenues, and expenses. One of the key tools value investors use is financial ratios. For example, to determine a company’s book value, a value analyst would subtract the company’s liabilities from its assets. This book value can then be divided by the number of shares outstanding to determine the book-value-per-share—a ratio which would then be compared with the book-value-per-share of other companies in the same industry or to the market overall. Growth investors are using today’s information to identify tomorrow’s strongest stocks. They’re looking for “winners”—stocks of companies within industries that are expected to experience substantial growth. They seek companies in a position to generate revenues or earnings greater than what the market expects. When growth investors find a promising stock, they buy it, even if it has already experienced rapid price appreciation, in the hope that its price will continue to rise as the company grows and attracts more investors. Where value investors use analysis, growth investors use criteria. Growth investors are more concerned about whether a company is exhibiting behavior that suggests it will be one of tomorrow’s leaders; they are less focused on the value of the underlying company. For example, growth investors may favor companies with a sustainable competitive advantage that are expected to experience rapid revenue growth, that are effective at containing cost, and that have an experienced management team in place. Value and growth investing are opposing strategies. A stock prized by a value investor might be considered worthless by a growth investor and vice versa. Which is right? A close review of your personal situation can help determine which strategy may be right for you. Over the past 10 years, growth stocks have outperformed value stocks six times and value stocks have outperformed growth stocks four times. Source: Thomson Reuters, 2017. Growth stocks are represented by the Wilshire U.S. Large-Cap Growth Index, an unmanaged index that is generally considered representative of growth stocks within the U.S. stock market. Value stocks are represented by the Wilshire U.S. Large-Cap Value Index, an unmanaged index that is generally considered representative of value stocks within the U.S. stock market. Index performance is not indicative of past performance of a particular investment. Past performance does not guarantee future results. Individuals cannot invest directly in an index. Securities offered through LPL Financial, Member FINRA/SIPC. Investment Advice offered through Provident Wealth Management Group, a Registered Investment Advisor and seperate entity from LPL Financial. 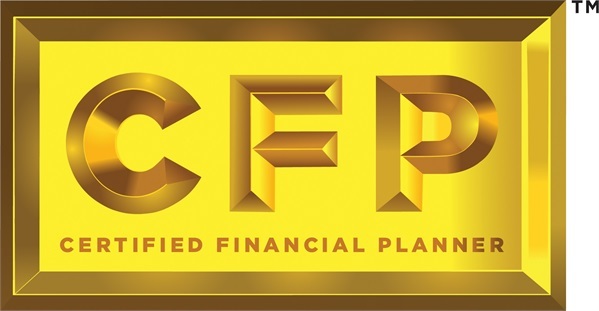 The information is not approved or endorsed by the Florida Retirement System.